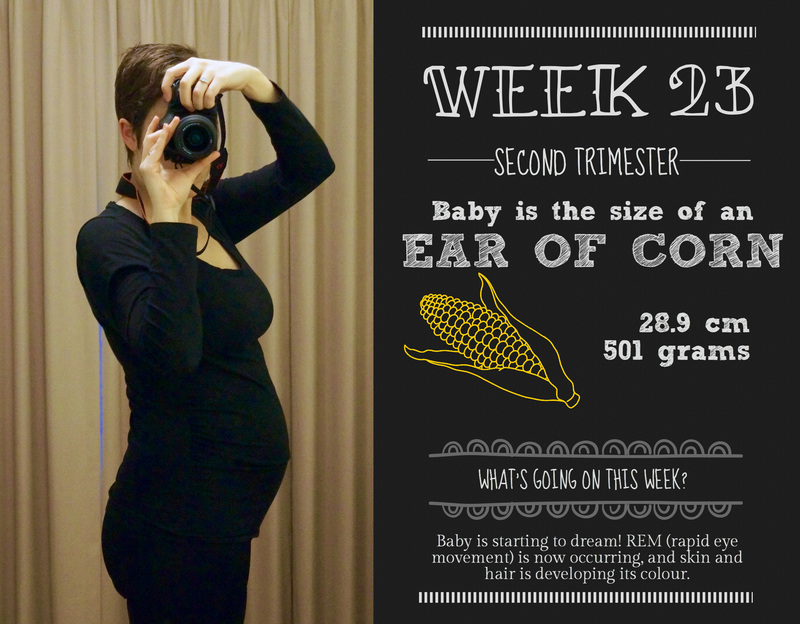 Baby: Juicy corn on the cob! Grub is steadily growing still, and is about to head into seriously large fruit/veggie territory. What I’m cooking: A dreaming little bub – Grub is starting REM (rapid eye movement), gaining some colour in her hair and skin, and while her skin is still fairly see through, she’s gaining more fat every week to provide a normal looking opaque outer layer. Main symptom: A serious case of the moods. I’ve been either snapping or crying a lot this week. There’s been reasons, of course, but still. Snappy Tom. What’s on this week: More of the uneventful same, unfortunately. While it’s lovely to have a relaxed few weeks in the pregnancy, it does feel strange when I forget I’m pregnant, only to be reminded by Miss Grub giving me a boot in the ribs. Well, it’s always the weeks where you think life will be its mundane self where everything goes crazy. I wrote the “what’s on this week” comment at the start of the week, just before we got the call to say Mr Nester was heading back to hospital for another (scheduled) operation. We were assuming we’d be given some kind of notice, like a couple of weeks, so we could get organised. No such luck. The hospital called on Friday, to say they’d booked Mr Nester in for Tuesday. Righto then. Cue frantic organisation of time off for him, some time off for me, organisation of dog sitter, and general feeling of being overwhelmed. Thankfully, the operation was a complete success, although some minor complications has meant more recovery time for Mr Nester, and a longer hospital stay. We’re currently on Day 5 of his stay, with at least a few more to go (no-one’s quite sure how many). This has meant that usual life has gone on the back burner. I’ve taken 2 days off work this week – one to take Mr Nester in for his op, and one to spend the day with him when he’s been having a rough time of it. Unfortunately he had an adverse reaction to one of his painkillers (ketamine – the horse tranquilliser!!) which caused him to hallucinate pretty severely. Thankfully they switched him off that drug and onto another, but it was a tough day for him. I’ve also had to unfortunately cancel my birth class, which should have been today, as I need to be with Mr Nester. I had a bit of a breakdown this morning, trying to juggle everything. With working all day, dashing home to walk the dog, dashing out again to the hospital, then lugging my sorry arse home again each day, it’s taken its toll. I just don’t have the stamina (or mental fortitude) that non-pregnant Jane did. Thankfully one of our friends has been able to look after the dog from today, and I’ve realised that I have to let a couple of things go. Work is going to have to deal without me, and my pregnancy has this week taken a backseat. My lovely husband comes first, and I’ll be there for him when he needs me, just as he’ll be there for me later this year, when I will most certainly need him. On the positive side, Grub has been very cute this week, kicking up a storm whenever I visited Mr Nester. She must be recognising his voice now, as she’s certainly making herself known. I’m really hoping that I will get to take Mr Nester home again in the next couple of days, and then I have him close at hand to look after, and to feed decent food to! I’m not sure how patients are supposed to recover with some of the gruel that gets slapped onto their plates. Yergh. Apologies for the ridiculously late post this week, but I did have a pretty good excuse this time. I’m planning on the next update to come through very soon, as I’m now nearly at 25 weeks and so running very behind!